The Mission Peak Brass Band features renowned French horn soloist, Lydia Busler-Blais, on the final concert of our season on May 10th at 8pm in the Smith Center of Ohlone College in Fremont. She will be performing Hoagy Carmichael’s Stardust and her own improvisations. Other works include Berne Patrol, Van Der Roost’s Toccata Festiva, as well as English Country Scenes, Ruby Tuesday, Blueberry Hill, The Girl From Ipanema, and Adagio from Spartacus. Lydia has performed with many orchestras and dance companies as a prominent soloist and improvisationalist. 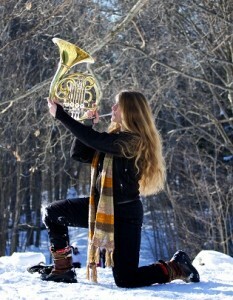 She received awards from the Consortium of Vermont Composers, the International Horn Society Meir Rimon Fund, and by the Massachusetts Arts Council. Tickets are $15 for general admission, $8 for youth under 12, and $10 for seniors and Ohlone students and staff, plus $2 Ohlone College parking fee per vehicle. Tickets may be purchased at the door, online at http://scboxoffice.ohlone.edu/ticketing/events.php or by phone, (510) 659-6031.